I was not lucky enough to make it out for the full week of Victoria Beer Week but I did make it early in the evening on Friday March 13th, 2015. 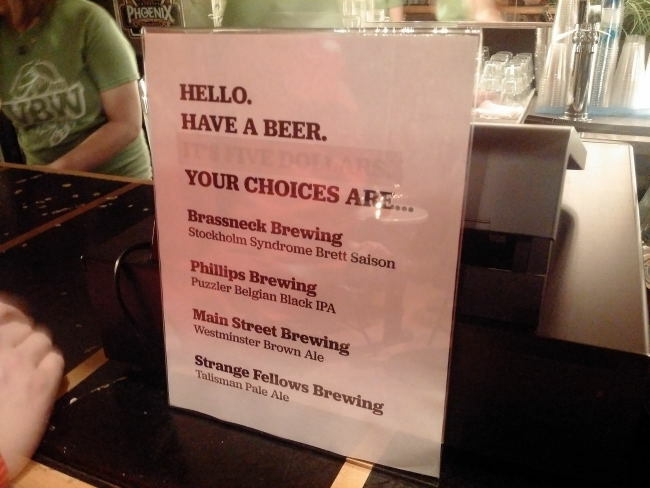 Once I checked into my hotel I headed over for the Craft Beer Revolution Town Hall event. The event was sold with this sentence “A panel discussion with some of BC’s brightest craft beer minds exploring what’s next for the province and Victoria in particular.” The talk was held at the Victoria Event Centre a medium sized room on the second floor of a building in downtown Victoria. Before the event began we were encouraged to grab a beer and socialize. They had some shirts and hats for sale as well as the second edition of Craft Beer Revolution for sale. Some of the very well known Vancouver Brewmasters and Brewery owners were in attendance. Once the room was full the event began. To start it all off they showed a video. Once the video was finished the host Khalil Akhtar of CBC called up the first panel. Panel 1 consisted of Nigel Springthorpe owner of Brassneck Brewery, Iain Hill Brewmaster of Strange Fellows and Nigel Pike of Main Street Brewing. The three well known brewery owners in Vancouver discussed all kinds of topics centering around the Vancouver Brewing scene. The topic that kept on coming up though was brewery lounges. seeing as breweries in Victoria for the most part don’t event have proper tasting rooms let alone lounges this is a very interesting topic for the people of Victoria. Once the panel finished talking Joe Wiebe came up to the stage to discuss his second edition of his book Craft Beer Revolution. The event was a book launch of sorts. 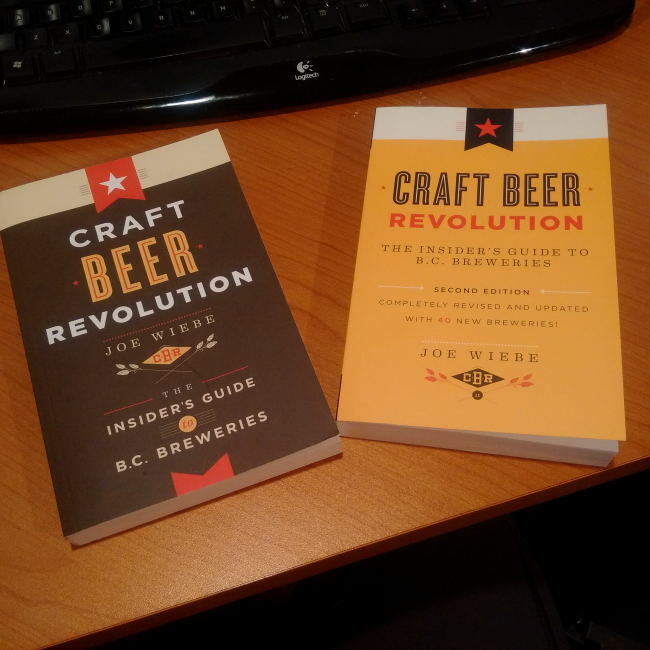 The first edition was released in 2013 and the second edition already has 40 new breweries! Now that is what I would consider a revolution! Joe discussed his thoughts on the brewing scene in BC and specifically Victoria. He also discussed what he would like to see happen in BC including filling growlers in local private liquor stores. This point seems to be a point of contention in Victoria as was noticed in the second panel. If you don’t have a copy of this book yet then you really need to pick up a copy! After Joe talked there was a second video. I wish I remembered what the videos were talking about but I was to busy socializing with Brewmasters and Joe. The second panel then was called to the stage that included Joe Wiebe, Karen Kuzyk of Category 12 Brewing, Matt Phillips of Phillips Brewing, Ben Isitt a Victoria City Councillor and Steve Watson who is part of a group that wants to open a brewery in Victoria under the Vancovuer brewery lounge model. 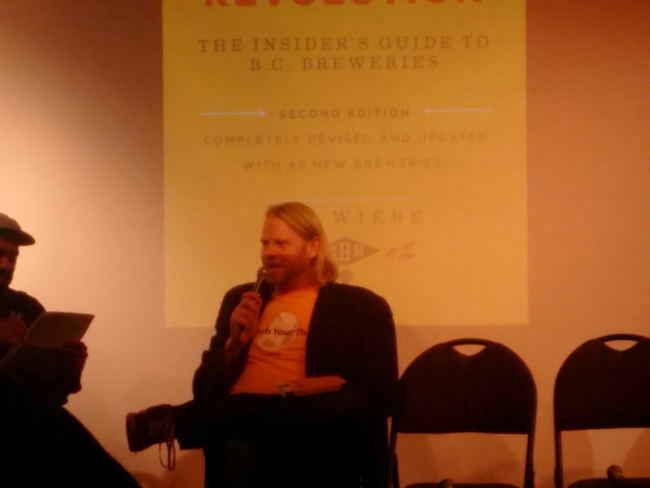 This panel showed quite quickly that not all of BC is on the same page on the brewing scene. For that matter not everyone in the City of Victoria is on the same page as this panel got heated at points. 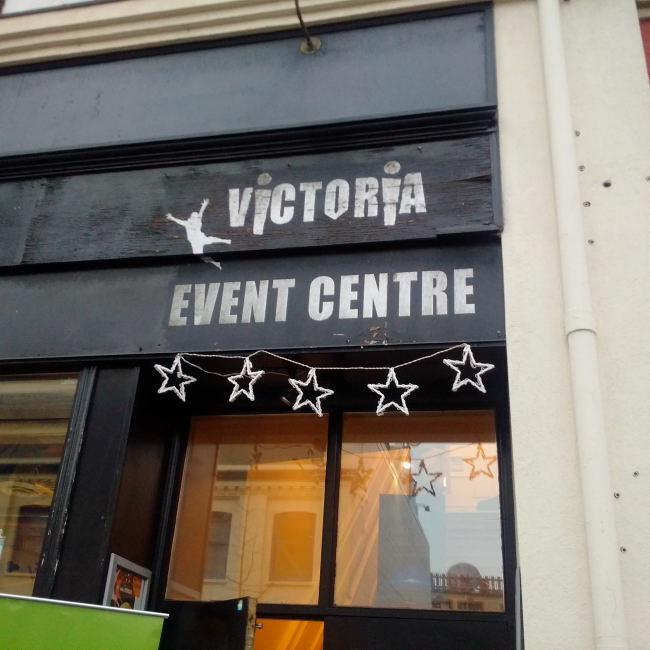 Victoria seems to be under the impression that if breweries open up brewery lounges it will hurt their local buyers like bars and restaurants. Victoria may be smaller than Vancouver but if my city has anything to say about this way of thinking it would be to say its a myth. Every time a new brewery opens up in Vancouver with a lounge it gets busy. The thing to look at is that every other brewery is also busy as well as every craft beer focused pub or restaurant. Brewery lounges seem to just bring more people to the craft brewing scene that like to buy local. If you have a local brewery where you can sit down and have a few sleeves you will build a connection and want to support that business. Another point that came under fire was Joe Wiebe’s suggesting that we have growers filled at local liquor stores. Breweries worry that beer won’t be served properly or lines won’t be cleaned correctly. These are all great points but if we look at the United States for a second we can see that this model can work really well. Not only at private liquor stores but at your local gas station also! When I was in Arizona the best beer store that also happened to fill growlers was a Chevron station. Sadly I think this will be a point of contention in the Province for a long time. Once the panels were done talking the room was free to discuss the topics that were brought up in the room. There was lots of discussion and more beer to be had by all. This was a great event that made you think deeply about where the brewing scene is going in Victoria and around the province. It is always good to keep and open mind and think of the best ways to help grow the brewing scene. Good on the organizers for dreaming up this event! This entry was posted in Beer Travel, Tasting Event and tagged bc, ben isitt, Brassneck Brewing, canada, category 12 brewing, cbc, craft beer revolution, Craft Beer Revolution Town Hall, heated, iain hill, joe wiebe, Karen Kuzyk, khalil akhtar, main street brewing, matt phillips, Nigel Pike, Nigel Springthorpe, panel, panels, phillips brewing, steve watson, strange fellows brewing, town hall, vbw, victoria, victoria beer week, victoria city councillor. Man, you always get out to the coolest things! I do my best. 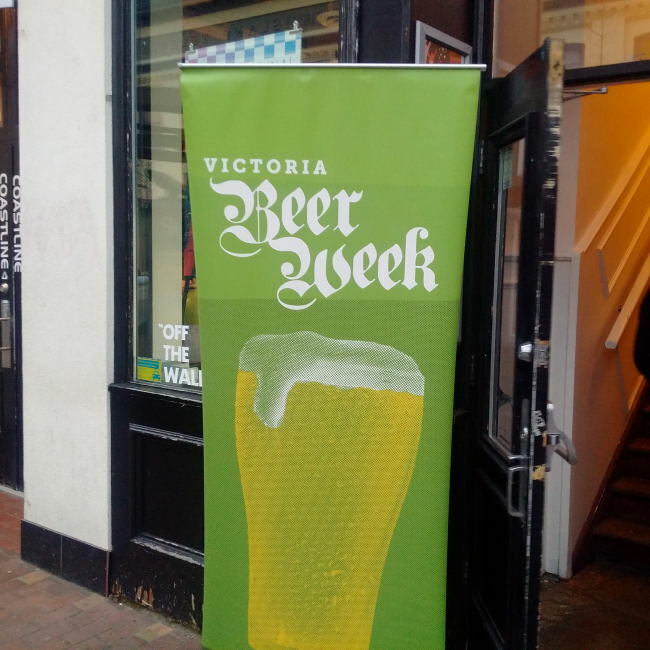 Did you make it out to any of the events for Victoria Beer Week? I did not, sad to say. Life has been too inconvenient lately. I need to move closer to town. Is there no transit option at all? I know its not like Vancouver but I would think it would be semi feasible. Or anyone in your area go? Cab share. I always enjoy hearing the breweries perspective on things like Growlers in Liquor stores and such, but at the same time I feel like our voice as consumers matter and they need to listen to their customers on this one. USA has this model down perfectly, I mean I could get growlers of Deschutes Mirror Mirror in Washington because of this model and that can’t be a bad thing! The only time growler fills at liquor stores or gas stations is interesting is when I am out of town and cant get to all of the breweries or there is beer from far away. I would far rather go to the source. But I agree this is a great idea for the average consumer. I mean come on it works in Manitoba! Personally I just want breweries to send their bloody bottles to Vancouver. Nothing is more annoying than going to a brewery for a fill and finding out they only fill from their standard lineup. But thats just me. I think growlers should be filled with one offs and limited releases only. Especially the out of town ones. Good point, I don’t know why they won’t fill a 1L growlers of limited releases. If I can order two glasses of that beer in that brewery, why can’t I get 1L of it to take home. I don’t mind paying more either. Probably a rule that made sense when 1 12oz glass was the allowance. That way more people got to try the beer. Now with lounges it doesn’t make as much sense. Why the hell did I not think of that already.